Topics: Services, Accountancy And Taxation, Business Advisory, Sme Consulting, Guides, and Business Briefs. 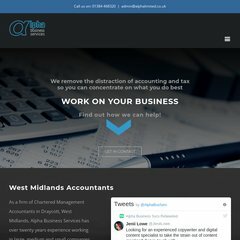 alphalimited.co.uk Change in Vat rate from 15% to 17.5 % from 1.1.10 - Alpha Business ..
alphalimited.co.uk Three Year Carry Forward on Pension allowances - Alpha Business ..
alphalimited.co.uk Penalties for CIS return submissions to change - Alpha Business ..
47 users visit the site each day, each viewing 1.90 pages. It is hosted by Solutions (England, Devon,) using nginx web server. PHP/5.3.23 is its coding language environment. ns2.santmedia.co.uk, and ns1.santmedia.co.uk are its DNS Nameservers. PING (77.72.7.58) 56(84) bytes of data. A ping speed test response, is timed at 111 ms.